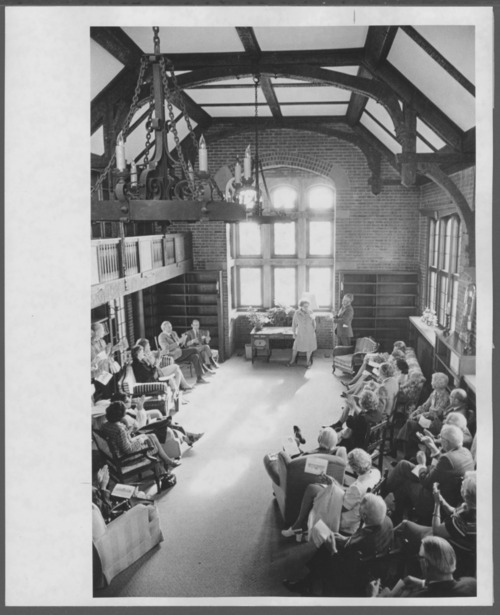 This photograph shows the library of the Evelyn Sharp House during the dedication ceremonies. Evelyn Sharp, a Trustee, donated the funds needed to purchase the house for use in After-Care Services. She is shown here speaking at the dedication The residents were adjusting to living outside the hospital, before moving on to total independence. The library was a two-story room with a balcony and fireplace. The Menninger Clinic has since moved to Houston, Texas, and this residence is currently a bed and breakfast.